A general uptrend in Penang property prices is expected this year as property developers offer better quality products to more discerning buyers. Penang-based property players interviewed by Business Times have cited construction material prices and inflation as reasons for them to price their units higher this year. They, however, gave no indication on the quantum of the price increase. 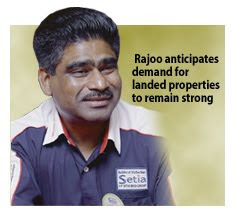 "Despite the risk of price increases in raw materials, the outlook for the property market remains positive this year," SP Setia Bhd general manager S. Rajoo said. "As the population increases, the demand for properties will increase as well," he added. Rajoo said available property units in the state have been decreasing tremendously over the past 10 years due to strong demand for selected property types. "We anticipate demand for landed properties to remain strong, due to the scarcity of land in Penang." Eastern and Oriental Bhd said the prices of its properties are determined closer to their launch dates and hinge on prevailing market conditions, raw material prices and market sentiment. E&O owns and develops Seri Tanjung Pinang masterplan township on Penang island that offers a range of properties including landed homes and high-rise residences by the sea. "Consumers are highly discerning nowadays and they desire a complete package which includes built-in wardrobes and cabinets, quality fittings along with fine finishing and appliances, said its executive direc-tor Eric Chan Kok Leong. "This in turn affects the eventual pricing of properties," Chan added. Hunza Properties Bhd group executive chairman Datuk Khor Teng Tong concurred, saying that the rising trend in property prices tend to reflect an upgrading of quality for the said units. "As buyers demand for better and higher quality, the price of building materials and land contribute to this rising trend," he said, adding that demand for properties in Penang continues to be strong for residential units in the face of a supply shortage. For Ivory Properties Group Bhd, better finishings and amenities, teamed with larger liveable spaces are expected to result in a higher range of property offerings. "With impending inflation, increase in prices of construction materials and factors such as all government-driven economic programmes like the Economic Transformation Programme, National Key Economic Area and the economic corridors which are due to drive the economy towards a higher per capita income, we foresee mid- to high-end properties continuing to be in demand," said its deputy chairman Datuk Seri Nazir Ariff Mushir Ariff. Ivory's ongoing and upcoming projects in the first half of the year, he noted, will comprise commercial, landed residential and high-rise residences in Penang. IJM Land Bhd, whose flagship "The Light" development is set to keep the company busy for the next 12-15 years, is looking at a slight price increase for its offerings. IJM Land general manager Toh Chin Leong cited construction materials and inflation as reasons for the revision of prices. With a gross development value of RM5.5 billion, The Light is a 60.8ha freehold waterfront development which will be built over the next 11 to 15 years. "We had a good year in 2010 and we foresee the market to be stable and consistent and look forward to another good year ahead," Toh said.